He was born at Dorking in Norfolk on 8th. January 1845. He served as a missionary in South Africa from 1870. He earned a reputation as being a hard working man. 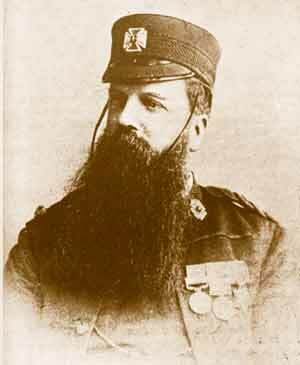 His part in the defence of Rorke's Drift won him the praise of several in their reports. He played a supportive role in the defence, but is not generally recognised as one of the main characters who took part in the defence. After the battle, he was regularly referred to as "Ammunition Smith". After South Africa he spent time as Chaplain in many theatres of war including Tel-el-Kabir in Egypt, the battle against the Dervishes in the Sudan and during the Nile expedition in Egypt. He later served in many posts in England, finally retiring and staying in the Sumner's Hotel in Preston, where he died on 26/27th. November 1918 from bronchial trouble which had afflicted him for six months. After a small military ceremony, he was buried in the Church of England plot in New Hall Lane cemetery in Preston, Lancashire. On entering the graveyard gates, take the road to the right. Go round a circular building and follow the bend to the left. At the second small path on the right, turn right. 20 yards along at the apex of the next junction on the left is the grave. A light colour red marble headstone with an apex top. Red flowers were in front when I was there.